Is Howard Dean, Tim Kaine, or DWS responsible for the poor leadership on what remains the real negative consequences of what should have been a better outcome for PBO’s 2008 election in the midst of an economic meltdown. 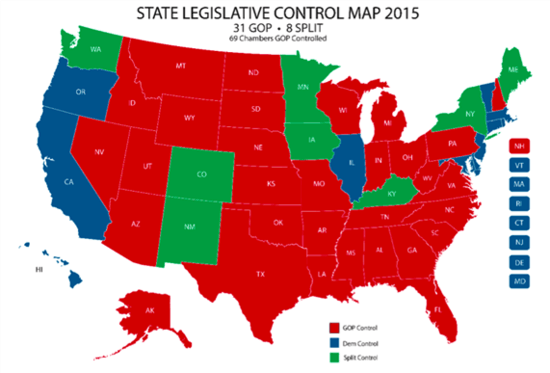 Does the DNC have a better plan to reverse the GOP’s RedMap Ratf*ck in 2020 starting with 2016. Daley’s book reminds us how pluralist democracy is in the local details and how while PBO may have been responsible for the 2010 debacle, he was let down by a DNC apparatus in some ways no differently than the midterms that gave us the Contract On(sic) America. In an op-ed piece in March 2010 in The Wall Street Journal, Karl Rove says we are going to use redistricting this year to take back the Congress. It was announced. It was not hidden. I don’t know if the Democratic leadership simply doesn’t read The Wall Street Journal, but it was right there. STEVE ISRAEL, WHO LED THE DEMOCRATIC CONGRESSIONAL CAMPAIGN COMMITTEE AFTER THE DEBACLE OF 2010 FOR DEMOCRATIC PARTY, TELLS ME THAT THE DEMOCRATIC NATIONAL COMMITTEE SIMPLY WHISTLED PAST THE GRAVEYARD. The REDMAP ratfuck, however, was done in such plain sight that Karl Rove himself announced it on the op-ed page of TheWall Street Journal.“Some of the most important contests this fall will be way down the ballot in communities like Portsmouth, Ohio and West Lafayette, Ind., and neighborhoods like Brushy Creek in Round Rock, Texas, and Murrysville Township in Westmoreland County, Pa.,” Rove wrote in early March 2010 — naming some of the specific towns where Republicans would come gunning for Democratic incumbents. By that time, Jankowski and his boss Ed Gillespie had repositioned the RSLC as a redistricting vehicle. This entry was posted in 2016 Election, Conservatives, Democracy, Equal Rights, History, Justice, Legal Theory, Neoconservatives, Neoliberals, Pennsylvania, Political Science, Politics, Presidential Elections, Racism, RNC, State Government, States, Uncategorized and tagged 2016 Presidential Candidates, Congress, geographic information systems, GIS, maptitude, reapportionment, redistricting, Republicans. Bookmark the permalink. I knew it was bad, but the re-districtig is even worse than I thought – will have to read this book – thanks Ann.